And her syncretism in Santeria is Oshun (also spelled: Ochun). She is the Patron Saint of Cuba and she has always been there for me during my entire life. I love her and I adore her. And am forever her servant. Lighting candles to her is a way of honoring her and getting her attention. I also love her !!! She did so much for me and I will always serve her. Common offerings I give her is orange with honey and cinnamon, sunflowers and yellow roses and flowers. She is such a loving mother. I lit a Caridad del Cobre candle on an altar dedicated to her that I have not been actively using recently. The flame has gone out two times today. Does this mean she is mad at me? I have never known her to be "mad" at a devotee. Most likely, whatever you are asking, the answer is: "No"
If this wasn't a Lucky Mojo candle, the problem could also be a bad candle. I give myself entirely to you. To prove my devotion, I consecrate to you, this day: my eyes, my ears, my mouth, my heart, and in word: my whole being; without reserve. Therefore, good Mother, as I am yours, keep me and protect me as your own property and possession. Yo me entegro del todo a ti. Y en prueba de mi filial afecto, te consagro en este dia: mis ojos, mi oidos, mi lengua, y mi Corazon. En una palabra, todo mi ser. Ya que soy todo tuyo, oh Madre de Piedad, guardame y defiendeme como cosa y posesion tuya. Thank you, Miss Aida. That was beautiful. For those of you who missed it, Miss Aida gave a great presentation on Our Lady of Charity of Cobre on the Lucky Mojo Hoodoo Rootwork Hour Radio Show for Sepember 4th, 2016. It was fantastic topic and show! As a Cuban that totally honors her, I have too much respect to say, "I've used her in any way" so I prefer to phrase it as, "I've humbly asked her for her help" and she has answered my prayers with tremendous results. And, please remember: You don't have to be Catholic, Cuban, or Latino to ask her for help. As I had stated on the radio show, she is venerated in many parts of the world. Because she helps in matters of almost everything all over the world! Thank you Miss Aida and Miss Cat for this nice information about La Virgen de la Caridad, and thank you very much for posting a prayer in Spanish Miss Aida. I have many Spanish speaking friends and I always tell them about the Lucky Mojo products, I keep telling them that besides Mexico, I found things at the store that I can't find anywhere else; but they feel a bit shy about their English. This is a wonderful way to reach out to them and if you both don't mind, I am going to copy the link and send it to all my Hispanic friends. And since not all of them are Catholic, they will love this information. I also want to thank Miss cat, Nagasiva, and Conjureman Ali for allowing me to present the Caridad del Cobre on their Radio Show. Thank you for all the wonderful information you gave on this topic. 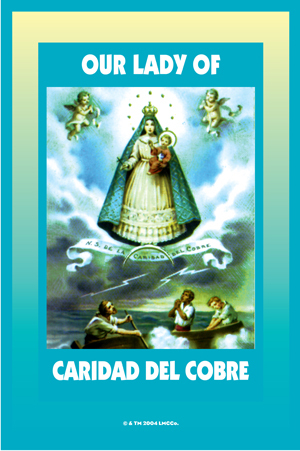 I love you, Virgen Caridad Del Cobre! Thank you so much for the information you provided on Our Lady of Cobre. I appreciate how in a short amount of time you were able to give me an understanding of her. My mother was Catholic but never shared her religion with us. She lit vigil candles with Saints in our home, but never explained what they were for. I've been thinking about my mother and her Catholicism quite a bit since listening to the show. I have to say that the topic of Our Lady of Cobre and your loving presentation of her really touched me. Thank you!!! Also, thank you MIss Cat for the radio program. I love the diverse topics that are discussed every week. There is always something new to learn. Thank you for providing this platform. I just purchased la virgen cardidad del cobre prayer card and wanted to know if i could tape my picture to the prayer card face to face and pray to her to be with me and guide as i carry it with me in my wallet? I had done this before with archangel michael prayer card as u suggested 2 me before and wanted to know if i could do it with cachitas card? Great question for the forum! Thanks! I would like to petition her for the 1st time ever. I have heard so many wonderful things about her. Since I cannot buy a candle for her since the Missionary Independent Spiritual Church has ended its candle services, what are my other options now? I have looked and called and I cannot find a spiritual store in my area that sells her candles. Can I buy a plain candle and print her picture off of the Internet? How does my altar have to be set up? What are her offerings? I am in need of some money to pay a few bills until the man call me about a job. How do I honor her? I am so new to this, so any and all help would be greatly appreciated. For other information about working with her, I recommend you scroll up through this thread and read the other posts from forum members and moderators.